Deals & Drops: Exploring Etsy and Fountain Pen Day Specials! When it comes to shopping for pens, ink, and stationery-related accessories, most people are aware of the standard pen retailers, eBay, and Amazon. But Etsy often gets overlooked. originally an online marketplace for makers to sell handcrafted goods, the mission has expanded a bit to “special, extraordinary items,” including not only handcrafted goods but small batch productions and vintage pieces. Here are some of my favorite stores. One Star Leather Goods. Keegan is my go-to recommendation for custom leather notebook covers and other leather pen accessories. He will custom make you a notebook cover to fit your favorite brand, and his quality is top-notch. I reviewed the Baron Fig Confidant Cover he made for me a while back. Skylab Letterpress. Based in Kansas City, Skylab makes great quirky stationery, enamel pins, coasters, you name it, often with a space theme. These notepads also belong on everyone’s fridge. Elegant Utility. Elegant Utility makes a diverse assortment of brass and wood desk accessories, mostly for woodcase pencils. I previously reviewed the Pencil Crown, which adds weight to the back end of your uncapped woodcase pencil for a more balanced writing experience. Duncan Shotton Design Studio. Perhaps best known for his Rainbow Pencils that made a splash on Kickstarter a few years ago, you need to check out his space-themed push pins (which I have on my corkboard in my home office) as well as his city-themed sticky page markers. My review here. Taroko Shop. Taroko Design makes notebooks using Tomoe River paper in a variety of sizes and paper weights. They also make leather covers that will fit both their notebooks and Hobonichi Planners. Ateleia Craft + Design. Probably the last high-quality machined pen I haven’t tried, but these are beautiful and garner rave reviews. The pens are build around either the Pilot Hi-Tec-C refill or the Pentel Energel, your choice. 18111com (Yoshi Nakama). Yoshi Nakama’s fountain pens have exploded in popularity over the past year or so, for their distinctive hand-painted designs and intricate roll-stoppers. Go see for yourself! PenBBS Official Store. PenBBS is a Chinese pen brand that makes a wide variety of reasonably priced fountain pens in some very unique acrylics. Some of their pens are piston-fillers. WrittenInRice Pen Wraps. You may have seen Claire’s pen wraps on pen show Instagram, but did you know she also sells on Etsy? Working Typewriters. I drool over this store all the time, but I don’t need any more typewriters than what I already have. If you’re in the market for a restored or customized typewriter, this store should be on your list. And, in case you think I forgot, HAPPY FOUNTAIN PEN DAY! Steep Discounts at Appelboom, and 18% off with the Coupon Code “FPD18” at checkout. Giveaways at Pen Chalet! In addition to giving away 10 different gift packs, Pen Chalet is running promotions and offering 10% off your order using the Coupon Code “FPDAY” at checkout. $30 Colorverse Ink Sets from Vanness using the Coupon Code “FPD2018” at checkout. Diplomat is one of those pen companies that traditionally has flown under the radar. They make high quality pens that are true workhorses, yet for whatever reason never garner the same amount of attention as the other major German brands. With a new distributor in place for the U.S. (Yafa, who also distributes Monteverde, Pineider, and Stipula, among other brands), I would expect that to change. Diplomat pens certainly had a wider presence at this year’s D.C. Pen Show, and more retailers are starting to carry their full lineup. So What’s New with Diplomat Pens? I’ve previously reviewed a couple of Diplomat’s offerings, including the iconic, Zeppelin-inspired Aero. During a bout of downsizing a year ago, I sold off my two Aeros, but missed having the pen so I picked up a new one in matte black. I immediately noticed a few differences. The logo on this Aero seems like it will stay put. The one aspect of the Excellence A2 that I dislike is the plastic cap finial - I think it cheapens the look of the pen. While Diplomat has not made any major design changes to the Aero, the finish seems less “matte” than in previous versions. This change may have been intended to increase durability - while the previous version looked great, the coating had a tendency to chip and flake, and as reflected in my prior review, the logo on the top of the cap actually scratched off. The snap cap also feels tighter, which is a welcome adjustment and makes the pen feel higher-quality. Previously, I had heard reports of Aero caps loosening over time and developing a tendency to spin and rattle, much like I experienced with the Lamy Aion. Even though Diplomat uses standard JoWo nib options in stainless steel or gold, they’re well-tuned and come engraved with Diplomat’s “propeller” logo. Recently, I’ve also had the opportunity to test the Excellence A2, Diplomat’s follow-up to the Excellence A. While the Aero receives most of the attention due to its distinctive design, the “Excellence” series is Diplomat’s conservative “flagship” pen - plainly directed at a business crowd - and it may remind you of a rounded version of Waterman’s “Exception” series (only much less expensive). According to the Diplomat website, the updated “A2” features a new and improved spring-loaded clip, as well as a “soft sliding click” cap that Diplomat claims is more durable. (From the product descriptions on the Diplomat website, it appears they made the same adjustments to the cap closure on both the Excellence line and the Aero.) I wrote with the Excellence A2 at work fairly extensively for two weeks, and enjoyed the pen. The section offers plenty of grip space, and the pen itself seems indestructible. A good clip is a crucial element to a daily workhorse, at least for me. The spring-loaded clip on the Excellence A is solid - no cheap folded metal here. The one potential drawback to the Excellence A2 is the weight, especially if you post. The pen is very well-balanced either way, but it’s still substantial. 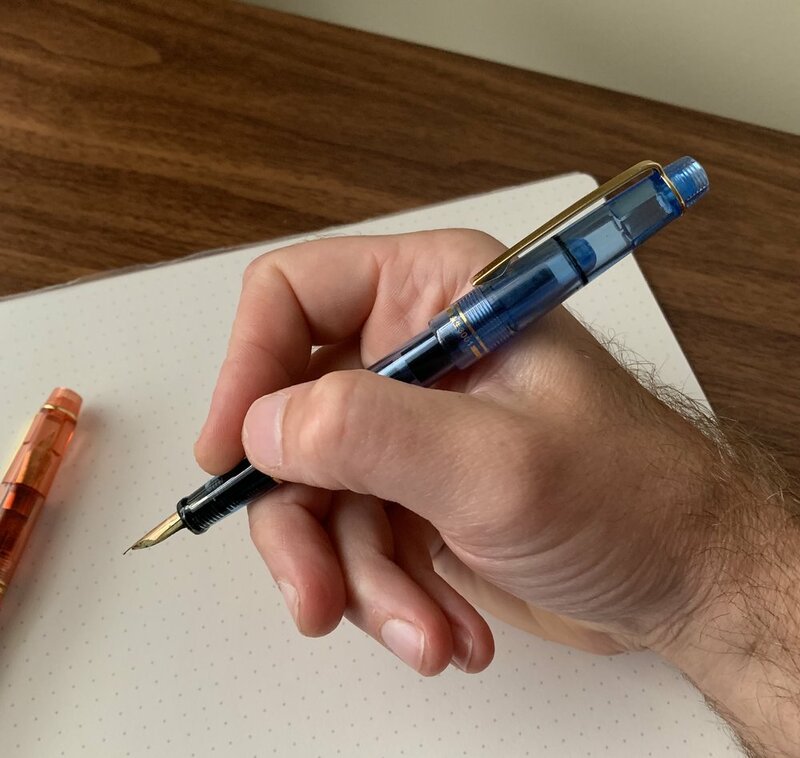 This didn’t end up as an issue for me - my hands are just large enough to handle a heavier pen - but if weight tends to bother you I’d test this one in person before committing to a purchase. The overall build quality on the Diplomat Excellence A2 impressed me, from the simple, subtle engraving around the cap band to the metallic “Midnight Blue” finish. Here you can also see the addition of the spring loaded hinge on the clip. Both the Excellence A2 and the Aero are nice pens that deserve your consideration if you’re in the market for a reliable workhorse that’s compatible with all of the JoWo nib units you may own. As I’ve mentioned before, as far as JoWo nibs go, Diplomat’s are some of the best out there. I’ve heard the company works closely with JoWo to ensure the nibs used on Diplomat pens are properly tuned, and I’ve not experienced any issues with them being misaligned or scratchy. I acquired both of the Diplomat pens featured in this post from site sponsor Pen Chalet. Pricing on both the Excellence A2 and the Aero ends up at a street price of around $150, sometimes a bit less if there’s an applicable coupon code. This places Diplomat around the same price point as brands such as the new Esterbrook, production-line Edison pens, and Franklin-Christoph (and maybe even a bit lower). Given the quality, the price is reasonable, and I have no difficulty recommending Diplomat as a brand to someone who likes their style. In addition to the traditional matte brown, black, silver, and orange, Diplomat recently released the Aero in two new colors: blue and “factory” (raw aluminum). Also, our sponsor Anderson Pens currently stocks a special edition version of the Aero in a gorgeous bright red. Be sure not to miss the latter if you’re considering an Aero. That one’s a stunner. Sponsor Post: All-Weather Pokka Pens! Many thanks to Pokka Pens for sponsoring the blog again this week! The big news is that Pokka has partnered with Rite in the Rain and Fisher to design a Pokka Pen that is “all-weather” capable! Featuring a genuine Fisher pressurized cartridge, the All-Weather Pokka provides steady, smooth ink flow in any conditions, and of course will write upside down. Look for a full review up on the site soon! Visit the Pokka website for full details. All-Weather Pokkas are priced at $12.95 for a two-pack, and currently are available in two colors, Blaze Orange and Black. Readers of this blog can use the coupon code “GENTSTA” to get 10% off their order. Note that only the Pokka Pens with the “Rite in the Rain” logo are All-Weather capable. A few recommended inexpensive fountain pens. Check out this week’s posts below! The Original Reborn: Hand-on with the New Esterbrook Estie (via UK Fountain Pens). The reviews of the new Esterbrooks continue to trickle out. I really like mine, and should have some thoughts on the blog in the coming weeks. Penwell Traveler Desk Accessory (via Clicky Post). Mike reviews the Penwell Traveler, which I also have in the queue for review. I love the original Penwell, and the Traveler looks to be just as much of a hit - the same concept with a more modern aesthetic. Faggionato PKS Blue Tortoise Review (via SBRE Brown). Stephen reviews the large size PKS Faggionato in Blue Tortoise. This is the larger version of the Petrarque fountain pen that I reviewed here. Danitrio Kama-Nuri Kamakura-bori Blue Tame-nuri on Takumi Fountain Pen (via Pen Addict). Follow that name? Congratulations to Susan on a beautiful new acquisition. Pelikan M400 Special Edition Brown Tortoise (via The Finer Point). Jenny reviews what I think is one of the best looking pens currently in Pelikan’s lineup. They need to add brown tortoise to all of their sizes, though I quite like the M400’s compact size. Nakaya Comparisons (via Fountain Pen Follies). Laura has gotten her hands on some Nakayas and compares them, including two colors I’ve had my eye on for a while. Kaco Retro EF in Green (via Well-Appointed Desk). Thanks Ana, another great looking, cool, really inexpensive fountain pen that I don’t need (but just bought). Ink Review: Taccia Uguisu (via Fountain Pen Follies). Laura reviews what I suspect will be my favorite of the new inks from Taccia. It appears much darker than Sailor’s Waka-Uguisu. Pilot Precise V5 RT (via Comfortable Shoes Studio). The capped version of the Pilot Precise has been a favorite of mine going back 20+ years to high school. The retractable version is every bit as good. Pineider Avatar Fountain Pen (via Pen Addict). Jeff reviews the Pineider Avatar. The acrylic used in these pens is gorgeous; I just wish the pens themselves were a bit wider. They’re a touch skinny for my preference. Anderson Pens. In addition to having one of the largest offerings of bottled ink in the world, Anderson Pens is an authorized retailer of a wide range of brands, including Sailor, Aurora and Faber-Castell. 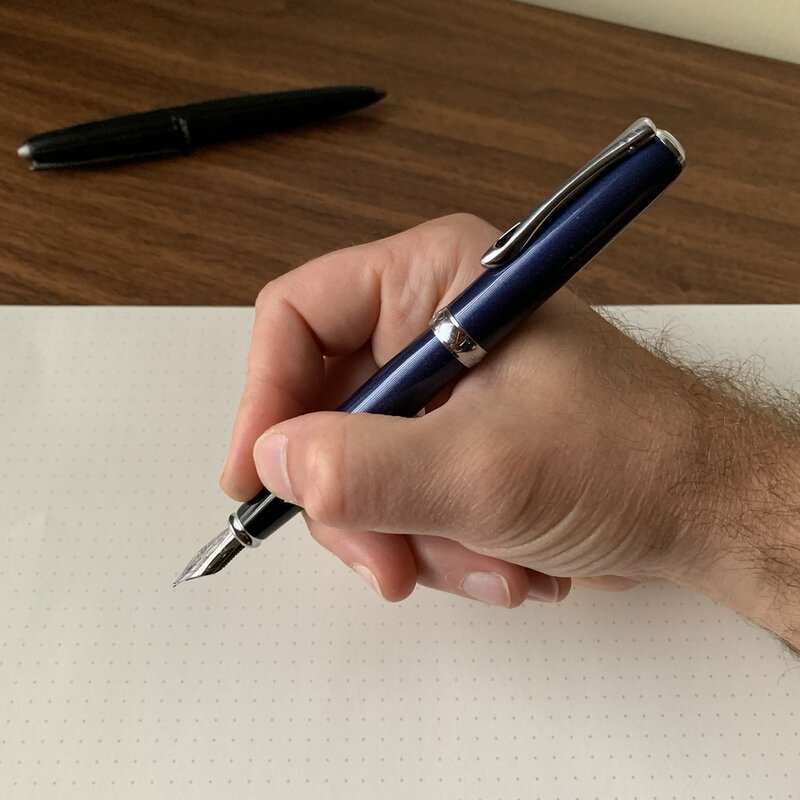 Check out the sponsor profile I published here, and don't miss out on their new special edition Sailor Pro Gear in Slate Blue. Ensso. Ensso makes what might be my favorite machined pen to date, the PIUMA fountain pen. You can check out my review here, and use the code “FALL18” for 30% off your order! This week on the blog I reviewed new “Find” notebooks from Kunisawa Stationery Company, and I also offered some more thoughts on my favorite inexpensive fountain pens, some of which you can find for just a few dollars! Finally, this week’s Deals & Drops focused on the new and special releases from the major German pen companies such as Pelikan, Montblanc, Diplomat, Lamy, etc. Spoiler alert! Of all the extremely inexpensive pens I’ve reviewed to date, the Wing Sung 3001 is my favorite. I’ve previously touched on how we seem to be living in a new “golden age” of fountain pens. Pen companies - both new and old - are regularly releasing new models every few months or so, each more irresistible than the last. 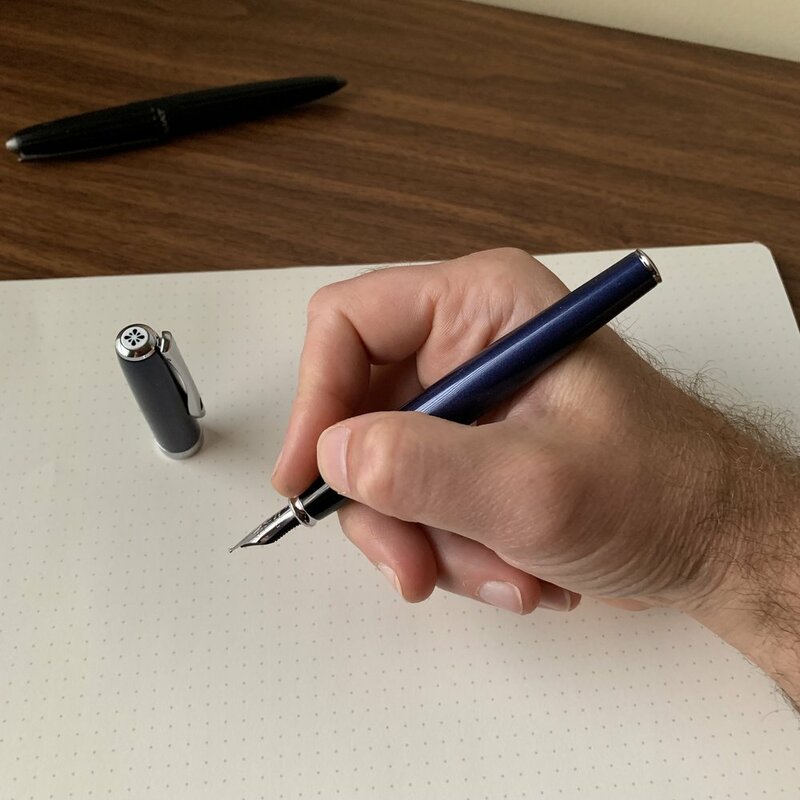 Sure, it may not be the best of times for the “legacy” companies such as Parker, Sheaffer, Waterman, etc., but the likes of Sailor, Pilot, Pelikan, Platinum, Lamy, and a host of relatively recent entrants have stepped it up. That said, in the ten years or so I’ve been following this industry, there’s been a real void at the “low end” of the price spectrum. 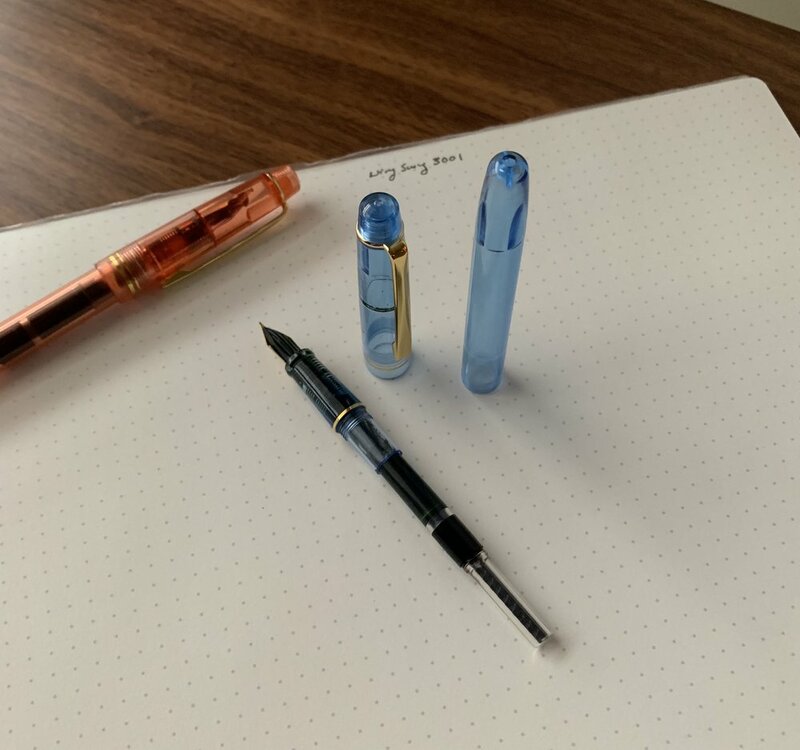 Other than two models from Pilot, the Metropolitan and the Kakuno, or the Nemosine Singularity, there just hasn’t been that much available at the sub-$20 price point - much less the $15 price point - and a lot of what was out there was ridiculously low quality. Sure, you can go with a Platinum Preppie, but it still sort of looks like a disposable pen. As vintage collectors are aware, even during the original fountain pen “golden era” from approximately 1920-1970, there was room in the market for so-called “third-tier” brands like Wearever, Majestic, etc. Some of these cheaper pens featured interesting materials, were quite nice looking, and sold for well under a dollar. (CENTS, people, imagine that!) Apparently there’s now a flourishing vintage Wearever collectors’ community. Wing Sung pens have excellent nibs, in my experience. Most are paired with a transparent plastic feed. Lately, I’ve been pleasantly surprised by the resurgence of inexpensive pens being manufactured in China. Inspired by bloggers such as Frank Underwater and the Economical Penster, I made a few VERY inexpensive purchases off of Amazon and eBay. We’re talking five-pens-for-$13 kind of cheap. And you know what? The quality was more than acceptable - most of the pens I tried had very nice nibs, solid plastic construction, and some even featured piston fillers. (To be honest, the quality on many of these pens was better than pens I’ve reviewed in the $50-75 price bracket.) Cheap pens have their place. Not only do you not have to worry excessively about losing them on your desk at work, at a hotel when you’re traveling, or even in the car - you can use all those crazy permanent, shimmering, non-freezing, flammable, likely-radioactive, pen-dissolving inks that we all know you want to test out. OK, Which Pens to Buy? From left: Wing Sung 3010, Wing Sung 3001, Wing Sung 3008, Wing Sung 618, and Wing Sung 698. I’ve discussed most of these pens in a previous post where I talked about how I was making more of an effort to test inks. It turns out I’ve found myself using these pens for much more than ink testing, and have carried a couple of the Wing Sung pens as daily writers. The 3001 model has become a favorite. Wing Sung 3010. Along with the Wing Sung 3001, these are the super-inexpensive pens that I’ve been using the most as daily writer. Like the 3001, these pens feature extra-fine nibs and cartridge-converter filling systems. Because the 3010 has a “snap cap”, it might prove to be less durable over time, but then again, the plastic feels pretty thick. Wing Sung 3008. The Wing Sung 3008 is a piston filling fountain pen that I originally purchased after using them at the DC Pen Show. Of the pens on this list, these are the ones that I’ve confined to “tester” status. They simply don’t feel as sturdy as others that I’ve used. The plastic feels a bit more flimsy and the blind cap on the piston is loose. That said, I’ve had no issues with them leaking or evaporating while they’ve been sitting on my desk, and the nibs are quite nice for a steel extra-fine. Jinhao Shark Pen. For a pure coolness factor, you can’t beat the Shark Pen. While I don’t own any, I’ve written with them at pen shows and everyone I’ve talked to that bought a pack enjoys them. A bit more money ($15-20) gets you into some very interesting pens such as the Moonman M2, the Wing Sung 601 Vacumatic, and the Wing Sung 618 and 698 piston fillers. Other people have had great success with the wide variety of acrylics and styles available from PenBBS (who also make popular inks). While I’ve used the Moonman and all of the Wing Sung piston fillers and vacumatics extensively, and they’re great, there’s something incredibly satisfying about writing with an excellent fountain pen that cost you $3. For that reason, if I had to recommend one super-inexpensive pen, the Wing Sung 3001 would take the prize.